Best-of compilations are an essential year-end crutch for beer bloggers, because the calendar thoughtfully schedules them for a time when we’re too comprehensively burnt, fried, bloated, pickled, and nogged to come up with any new ideas. And readers have fun telling us how stupid they are, so everyone wins. The only drawback is that it’s tough to remember all the great beers from early in the year, so the lists inevitably favor brewers who happen to release their heavy hitters in the fall. I’m trying to be more conscious of that bias in 2015, which is why I intend to run the occasional “Hey, maybe this is the best?” post so I can scan the Drunkspin archives in my sodden, bloated glory on December 29th and come up with a seasonally diverse batch of bests. Among the early highlights this year: Allagash Century Ale, a brett saison that just might be worth its ruinous price of $15 per 375 mL (that works out to $1.19 an ounce, which is at the high end of the spectrum for trophy beers in bars, never mind at retail); Boulevard Love Child #5, a funky, sour, blended beauty; and today’s featured attraction, Victory’s fantastic new Kirsch Gose. We’ve covered gose a couple of times before, but here’s a quick refresher: It’s an old German style made with at least 50 percent malted wheat, with lactic bacteria employed along with the traditional brewer’s yeast to produce a sour element. Coriander and salt are added to augment the relatively low hop dose. The result is not as weird as it sounds, with the coriander providing a spicy kick while the salt dries out the finish—lots of great beers are spicy and dry, no big deal! But yeah, gose is still kinda weird. Anderson Valley’s Kimmie, the Yink, and the Holy Gose played a big part in the style’s recent mainstream revival, as did a growing acceptance of sour beers in general. Flavored goses are starting to make their move, too. The addition of citrus and other fruit is tricky, because when it works, it’s fantastic, but it runs the risk of turning a light, effervescent, wheat-y beer a bit too soda-poppish. I like Anderson Valley’s Blood Orange version, but I don’t prefer it to the original, because the orange makes it a bit too sweet, and in so doing undermines the original intent of a gose (says me, anyway). In broader booze circles, “kirsch” typically refers to brandy distilled from cherries. As pertains to beer, it just means “has something to do with cherries.” Victory Kirsch Gose opens with a sweet cherry aroma that turns sour on the palate as the relatively light salt component emerges to provide a dry, bracing finish that keeps the strong fruit character in check. 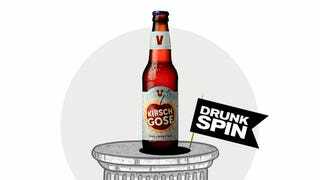 Victory Kirsch Gose (4.7 percent ABV and about $10 per four-pack of 12-ounce bottles) deftly employs slightly tart cherries to produce a beer that is true its sour heritage while also displaying a deep, real fruit component. It’s a hell of a trick. This is a seasonal release, so get some immediately, and then move on with your beer life; I’ll be back in December to remind you to start getting excited for next spring.